An important element of the total collegiate experience is the ability to get involved in the local university community. 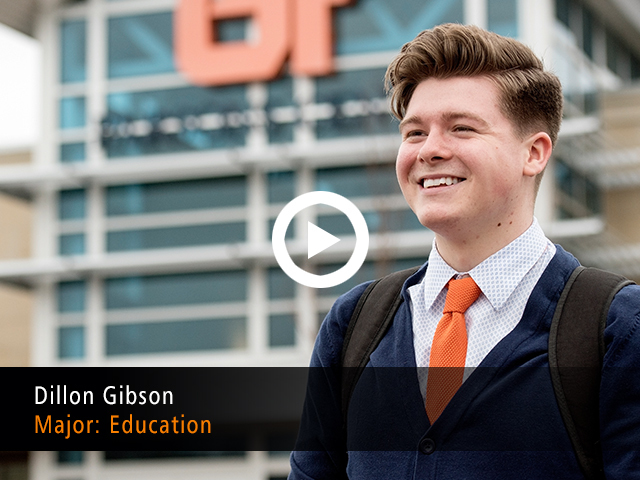 Dillon Gibson, a freshman enrolled at the UT Martin Parsons Center, has already found his place in the Parsons Center family and enjoys creating relationships with the students and faculty who surround him every day. “I remember when I first came and they asked me to be in the student ambassadors group. They said, ‘We’re a family and we look out for each other,’” he recalled. A student ambassador’s primary role is to help inform the local community about opportunities available at the Parsons Center. The ambassadors visit area high schools and speak with students who may be interested in enrolling at the UT Martin Parsons Center. Gibson, a Parsons resident, chose the UT Martin extended-campus center in Parsons because it enables him to remain active in the groups that are important to him. “I’m very family-oriented and church-oriented. … I didn’t have to move away from all that. I could stay here and be who I am and be with the people that I love,” he said. UT Martin’s four extended-campus centers offer students the opportunity to receive the same strong UT Martin education in their own local communities.